Clifton Hill is a residential suburb 4 km north-east of central Melbourne, separated from Collingwood by Alexandra Parade and the Eastern Freeway. Its eastern boundary is the Merri Creek, and the northern boundary is the road to Heidelberg. The Melbourne City Council operated a basalt quarry in Clifton Hill, between Yambla Street and the Merri Creek in the 1850s, continuing until the 1950s. Most of the other land was held by the Crown for agistment purposes, and Government land sales began in 1864. Residential settlement ended the use of Clifton Hill for the burial of sewage in the 1870s. It was the more salubrious part of Collingwood council's area, having elevated land with larger houses and two reserves, Mayors Park and Darling Gardens. It had about 7 houses per acre compared with 15 per acre in Collingwood, south of Alexandra Parade. Most were red brick and terra cotta tile compared with weatherboard and iron roofs in Collingwood. An industrial landmark, the shot tower, was constructed beside Alexandra Parade in 1882. Primary schools were opened in Gold Street (1874) and Spensley Street (1891). 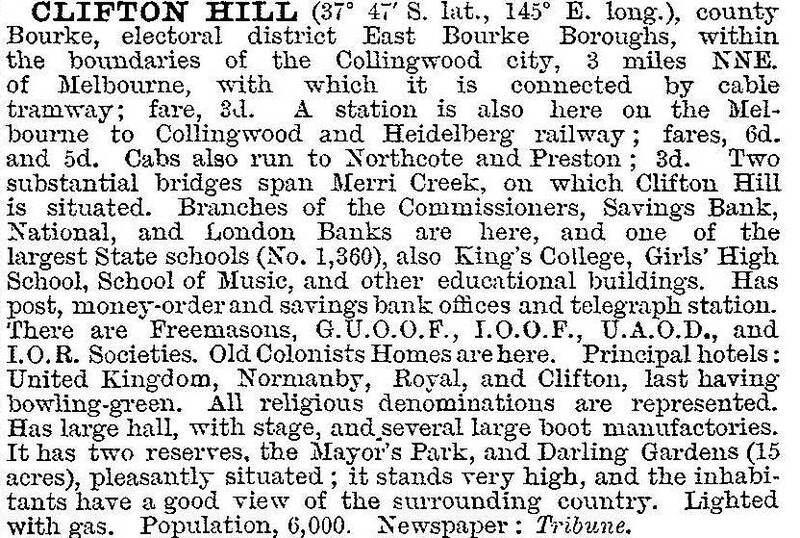 The shot tower and the Gold Street school are on the Victorian Heritage Register, as is the railway station (1888). A prominent Catholic church in Queens Parade opened in 1882, followed by a Catholic primary school in 1886. The railway line connected Collingwood and Heidelberg until a link between Princes Bridge and Collingwood was opened in 1901. The Merri Creek loops around the eastern and part of the northern boundary. By the 1990s the whole of the river bank was edged with parklands, including a large space occupying the quarries site. Clifton Hill underwent accelerated gentrification compared with Collingwood: by 1987 Clifton Hill's median house price was 112% of the metropolitan median, and in 1996 it was 160%. Some residential housing in Clifton Hill was threatened by the proposed construction of the East West Link project road tunnel. The Clifton Hill primary school had 607 pupils in 2014. Residents are financially well off (incomes 71% above the Victorian median) and English is spoken at home by 81.4% of residents (Victoria, 72.4%) (2011 census).